Gorgeous leather jackets, skinny jeans you'll wear every darn day, the perfect basic tee — and so much more! All up to 40% off! 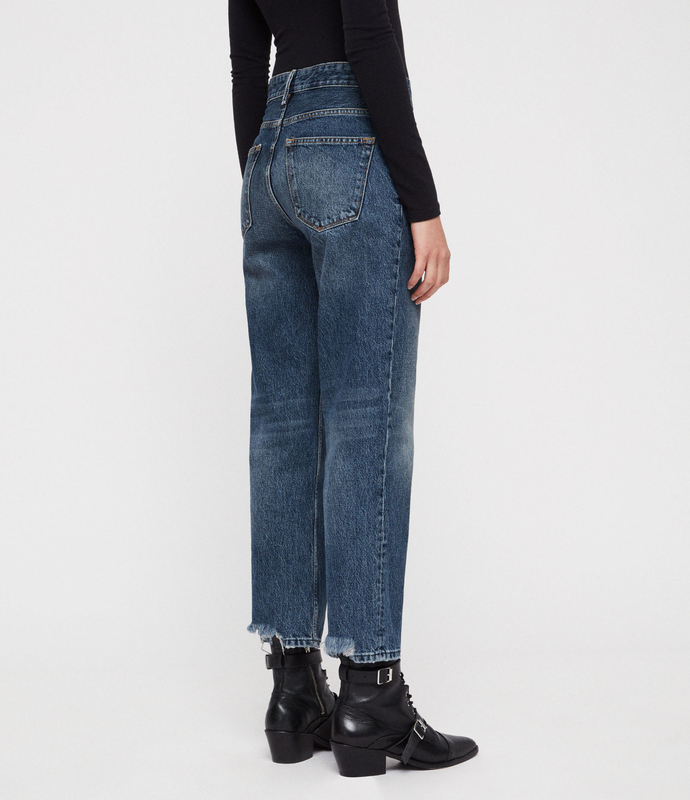 AllSaints is a dream come true for quality goods — from leather jackets to denim that does not rip after seven wears – their pieces are truly some sort of sorcery. AND GUESS WHAT?! They are now having a mid-season sale in which a ton of their gorgeous products are up to 40% off. Are you sweating? Because I certainly am. Envision everything from splurge-worthy leather jackets, basic tees, cropped sweaters, raw denim, and so much more — all up to 40% off. And the best part? AllSaints specializes in classic designs that will never go out of style, so you can wear the jacket you get this season for the next 900 seasons. A total win! 1. 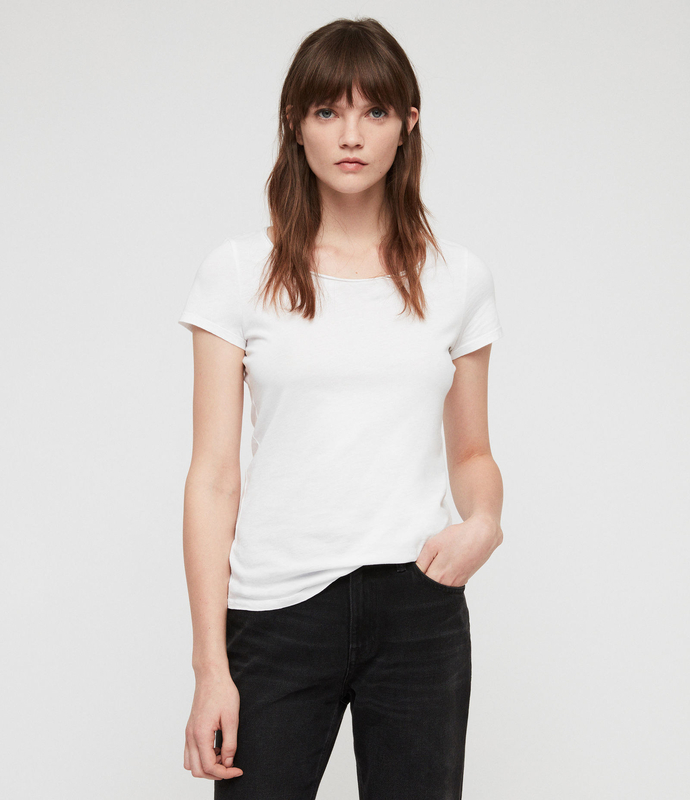 A 100% cotton t-shirt you can hypothetically wear every single day. Pair this with some go-to jewelry, your favorite denim, and BAM! You're now both comfortable and stylish, and it took about 0% effort. 2. A slim fit leopard top that I am officially dubbing THE quintessential ~I'm going out~ top. No more scouring your entire closet to find a dinner- and drinks-appropriate shirt. This is it! 3. Stretch cotton leggings designed with gathering around the waist to trick everyone into thinking you're wearing a legitimate skirt. Why YES, world — I DID actually try this morning! 4. A t-shirt that's as versatile as a basic tee — but better. Let's get a round of applause for that layered detailing, which gives this top an extra dose of va va voom. 5. Skinny jeans synonymous with p-e-r-f-e-c-t-i-o-n. 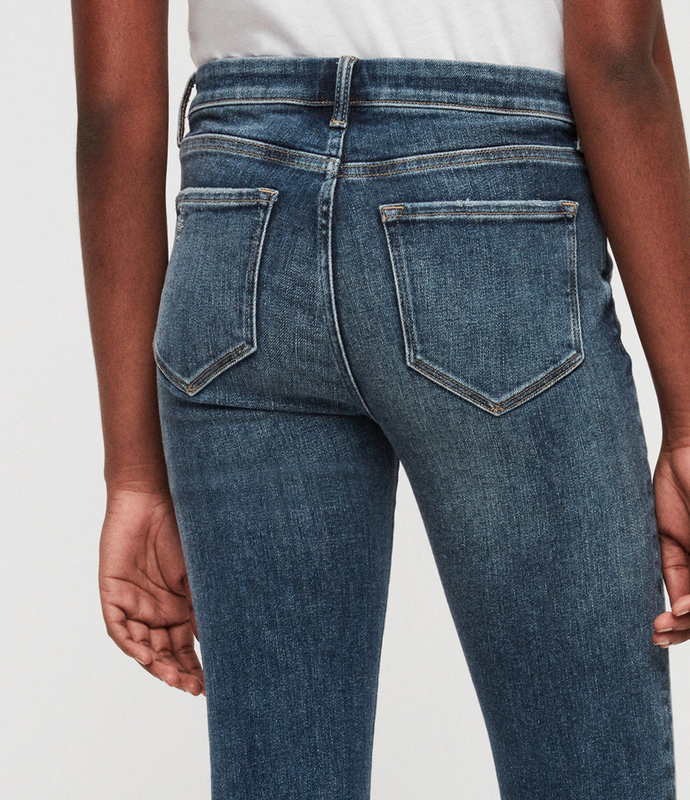 These are designed the perfect amount of stretch, the perfect indigo blue wash, and the perfect rise (just below your belly button). 6. A leather bucket bag that is truly worth the splurge. You'll be able to wear this every darn day, and the amazing quality will prevent it from showing any wear or tear. 7. High-waisted panel leggings perfect for running daytime errands AND "I have to get dressed up" nights. That leather detailing is truly 👏. 8. A ridiculously soft cropped sweatshirt you can pair with any bottom in your closet. From denim jeans to satin midi skirts, this super versatile piece will never clash. 9. A wool blend midi dress so gorgeous, it'll make your spring allergies seem significantly more bearable. Sure, you're sneezing every five seconds! But at least your outfit is on point! And that's all that really matters. 10. A splurge-worthy leather jacket available in a ruby red color that you will treasure forever and ever...and ever and ever. This is one of those priceless pieces your grandchildren will be excited to inherit, you know? 11. An asymmetric bodycon skirt that TRANSCENDS the shackles of seasonal dressing. You'll be able to wear it in fall/winter with some tights and booties OR in spring/summer with your favorite pumps. 12. A floral blouse you can quickly throw on at 2:08... when you told your friends you'd meet them for lunch at 1:30. You're late. Let's hurry it up. 13. 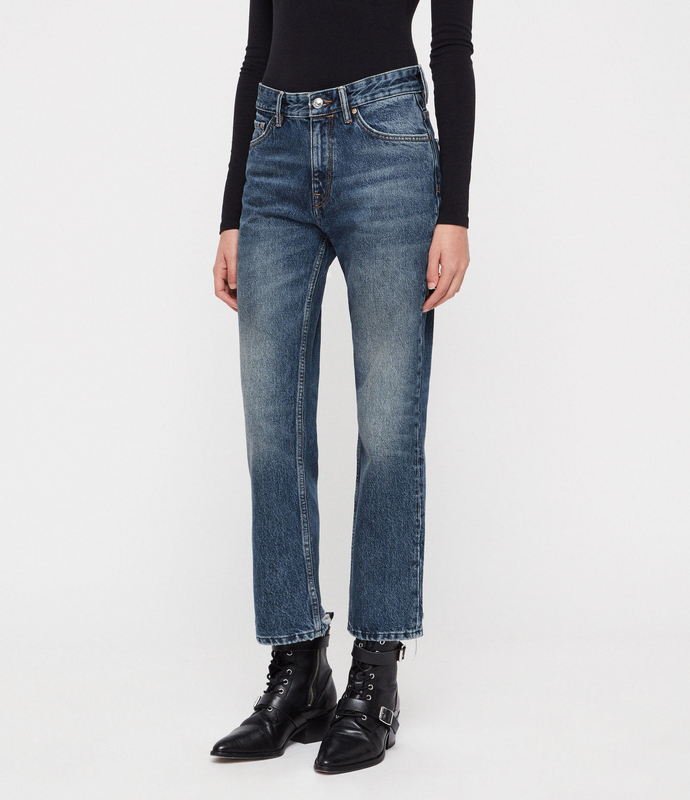 High-waisted straight jeans made with rigid, pure cotton denim — meaning they may feel snug at first, but they'll eventually stretch ever so slightly and will mold perfectly to your shape. 14. A ruffled skirt because has spring has SPRUNG and it's time to show off some LEG! And what better way to get into warm weather dressing than by donning this adorable mini? 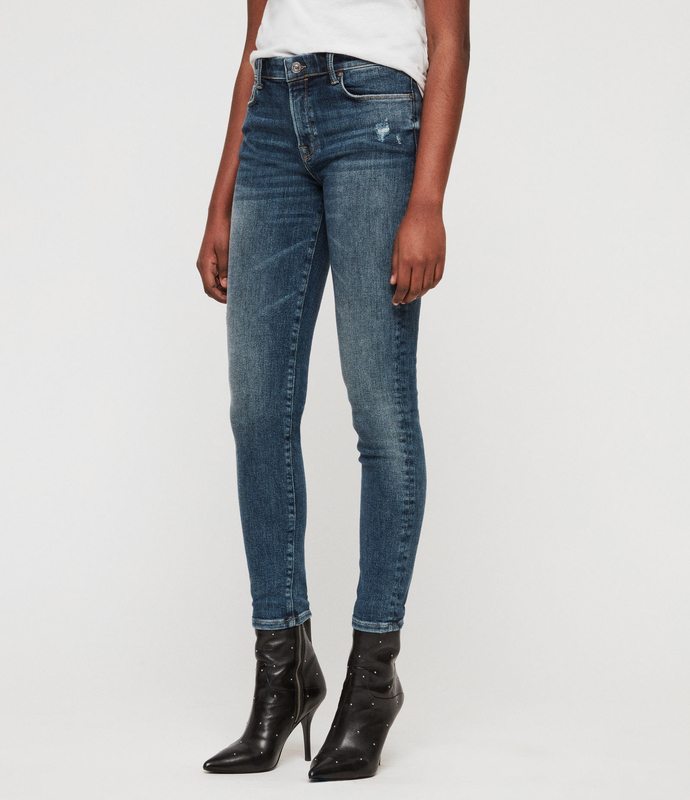 Check out the rest of the AllSaints sale!